I’ve upgraded dozens of systems with solid-state drives. In every case I’ve gotten a “W” reaction, as in “Wow!” “Whoa!” and “No way!” (not to mention “Kewl!”). Given a relatively modern CPU, an SSD delivers more satisfaction than any upgrade I know. Don’t take my word for it, however: Believe the numbers. Most people who want to boost their desktop computer’s performance will upgrade either its GPU (easy) or its CPU (only slightly more complicated). Typically it’s impossible to upgrade either component on a laptop. Storage upgrades, meanwhile, usually happen only after you’ve accumulated too much digital stuff (movies, music, and what have you), not when you’re looking to make your PC faster. 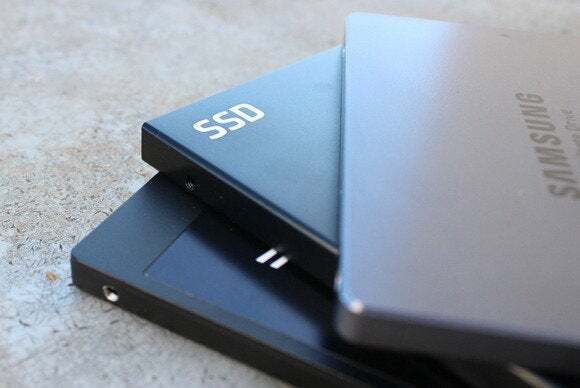 Most SSDs don’t offer a lot of storage capacity, so they’re relatively expensive on a per-gigabyte basis compared with mechanical hard drives. Modern SSDs are many times faster than their mechanical cousins, though, so it stands to reason that installing one in an older PC will improve the system’s performance. But just how much of an increase can you expect to realize? The typical SSD product review is designed to test the drive’s maximum performance, so the testbed usually consists of a state-of-the art PC. What happens when you put an SSD into an aging computer? Do the PC’s older components—its CPU, motherboard, core-logic chipset, and the like—squelch the SSD’s potential? We replaced the hard drive in this late-model Toshiba notebook with an SSD and saw tremendous performance gains. To answer those questions, PCWorld Labs ran our Notebook WorldBench 8.1 benchmark suite on a recent-vintage Toshiba Satellite P75-A7200 laptop powered by a fourth-generation mobile Core i7-4700MQ CPU (part of the processor family code-named Haswell), and our Desktop WorldBench 8.1 suite on an older Maingear tower PC equipped with a second-generation Core i7-2600K (Sandy Bridge). Our colleagues at Macworld helped us out by running SpeedMark on an Apple MacBook Pro with a third-generation Core i5-3210M (Ivy Bridge). All three test suites measure the performance of the entire system—not just its storage subsystem. The Labs staff first benchmarked each computer with its original hard drive, and then replaced that drive with an SSD and reran the benchmarks. The performance differences in all three scenarios were stunning. 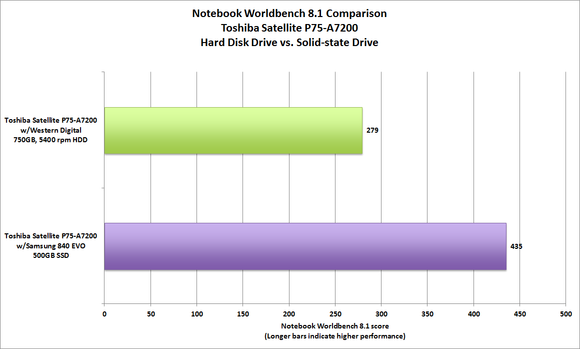 When we benchmarked the Toshiba Satellite P75-A7200 with its stock 750GB, 5400-rpm hard drive (a Western Digital Travelstar HTS541075A9E680), the machine posted a Notebook WorldBench 8.1 score of 279. That’s good performance. 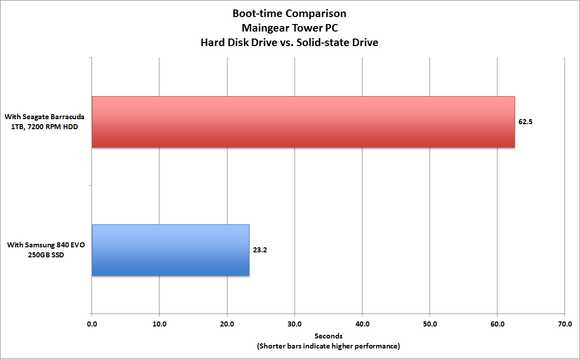 But when we replaced that drive with a 500GB Samsung EVO SSD, the laptop’s score jumped to 435—a 56 percent improvement. An SSD upgrade can boost the performance of a brand-new notebook, too. 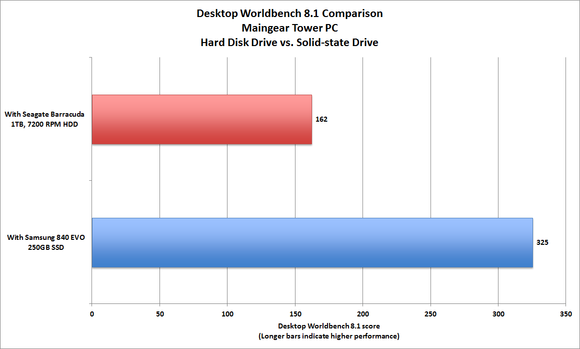 When we tested the Maingear tower PC with its original 1TB, 7200-rpm Seagate Barracuda ST31000524AS hard drive, the computer earned a Desktop WorldBench 8.1 score of 162. With a 250GB Samsung 840 EVO SSD installed, the score doubled to 325. Replace an aging desktop system’s hard drive with a fast SSD, and you’ll feel as if you have a whole new machine. The SSD upgrade dramatically improved the tower’s boot time, too, reducing it to 23 seconds from 63. We didn’t see as much of an improvement with the Satellite P75-A7200, because that machine benefits from a more recent CPU and core-logic chipset. The MacBook Pro, meanwhile, arrived with a 500GB, 5400-rpm Toshiba MK5065GSXF hard drive. Its SpeedMark score jumped 55 percent—from 121 to 188—when we replaced that drive with the 500GB Samsung 840 EVO. No one likes to wait for a computer to start up. An SSD upgrade reduced this PC’s boot time by half. Any PC running a CPU introduced within the past six or seven years (that is, an AMD Phenom; an Intel Atom, Core 2, or Core i3/i5/i7; or any newer processor family) is a good candidate for an SSD upgrade. You’ll still see a performance boost with an SSD even if your CPU is older than those mentioned. In such cases, however, it’s probably time to put that computer out to pasture, because there are many other advancements—chipset improvements, new bus technologies, faster I/O ports—that you can’t get short of replacing your motherboard (at a minimum). You should also consider an SSD upgrade if you’re buying a new computer. A PC with a midtier CPU and an SSD (or an SSD cache for a mechanical hard drive) will start up faster and feel significantly faster than a computer that’s hobbled by a slow hard drive, even if it has a higher-end CPU. If you want it all and have the budget to indulge that strategy, buy a PC with both types of drives. It’s hard to do so with a laptop, though, so in that situation you’ll want to buy the largest SSD you can afford. An alternative mobile strategy is to supplement the internal storage with an inexpensive, high-capacity external hard drive (500GB mechanical drives cost about $60). You can buy an external SSD, too, but those devices are much more expensive. SSD technology has changed rapidly, and performance has nearly tripled in just a few years. You can find a lot of SSDs on the market, and shopping strictly by price can be a big mistake—that supercheap drive you just pulled out of the bargain bin might have slow memory and a dated controller that kills its price-to-performance ratio. You’ll see big performance differences among newer drives, too: Samsung’s 840 Pro, for instance, is the fastest consumer SSD we’ve tested. Other top performers include Seagate’s 600 series, Corsair’s Neutron series, the OCZ Vertex and Vector series, and SanDisk’s Extreme II series. SSD upgrades are easy to perform on a desktop PC, and only slightly more difficult on a laptop. Keep in mind that a higher-capacity drive will deliver better performance than a lower-capacity model from the same family. Such results are due to the fact that higher-capacity drives have more NAND chips and more channels for data to travel over, but the phenomenon typically begins to flatten at about 256GB. When you’re looking at capacities, be aware that some manufacturers overprovision memory (they reserve some cells to replace others that wear out). A 480GB SSD, for example, might have the same amount of physical memory as a 512GB drive but set aside 32GB. The same goes for 240GB drives versus 256GB drives, and 120GB models versus 128GB drives. Overprovisioned drives can handle more program/erase cycles, so manufacturers usually give them longer warranties (five years versus three). Speaking of program/erase cycles, you can safely ignore warnings about prematurely wearing out your SSD by writing to it too often. Modern SSD controllers use wear-leveling techniques to spread write operations evenly across all the memory cells. You should expect even a non-overprovisioned SSD to have a useful life span of ten years or more under normal circumstances. Does your desktop PC lack a SATA 6Gb/s interface? Apricorn’s Velocity Solo x2 adds two of them, and you can mount one SSD right onto the card. Finally, an SSD will use one of two interface technologies: SATA 3Gb/s (also marketed as SATA 2 or SATA II), or the newer and faster SATA 6Gb/s (aka SATA 3 or SATA III). Drives with the newer interface are compatible with computers outfitted with the older technology, and vice versa. But a SATA 6Gb/s drive will deliver its best performance only if it’s connected to a SATA 6Gb/s interface. It is possible to add that feature to an older desktop PC with an add-in card such as Apricorn’s Velocity Solo x2, provided that the computer has an available PCIe 2.0 x2 slot, PCIe 3.0 x1 slot, or better. SSDs aren’t cheap, but benchmarks don’t lie: Our tests show that they can pay for themselves, and then some, if you install one in an older computer or choose one for your new computer. The benefits to overall performance and even boot time will make you happy that you took the plunge. Editor's note: This story was updated 9/27/2013. With an extra hard drive bay (for an SSD) and two free SODIMM slots, the Satellite P75-A7200 can easily be made faster. But there's no getting around its reliance on integrated graphics. If your PC doesn't have a SATA 6-gbps interface, this device adds it, caddies one drive, and let's you attach another via a cable.